In the anime, when this monster detaches an Xyz Material, it eats it. Then, the two spikes on its chest open and shoot flames to destroy an opponent's monster, inflicting damage to the opponent. The number 61 can be seen on this monster's left chest spike. This is Scorch's Number monster, while his tag partner uses Number 19. If 61 is rotated 180￮, it shows the number 19. They're both Rank 5 Dinosaur-Type Xyz Monsters whose themes (Lava and Ice) and Attributes are reversed. This monster appears in the artworks of Number Karma and Number Fortification. Destroying the monster and inflicting damage are considered to happen simultaneously. If after this card activates its effect it's flipped face-down and face-up in the same turn, it can attack the opponent directly that turn. Even if the target is flipped face-down at the time of the resolution of the effect, the target is still destroyed and damage is inflicted according to its original ATK. Also, if the target leaves the field at the time of the resolution of the effect, since it is not destroyed by the effect of "Number 61: Volcasaurus", no damage is inflicted. : As for the effect of "Number 61: Volcasaurus" that destroys a monster and inflicts damage, if the target is flipped face-down at the time of the resolution of the effect, is the monster still destroyed? Also, if the target leaves the field at the time of the resolution of the effect of "Number 61: Volcasaurus" so that it's not destroyed by this effect, is the damage still inflicted to the opponent? After "Number 61: Volcasaurus" activates its effect, if "Skill Drain" is activated, "Number 61: Volcasaurus" cannot attack the opponent directly. Also, if "Skill Drain" is active and "Number 61: Volcasaurus" activates its effect, "Number 61: Volcasaurus" cannot attack the opponent directly. : After "Number 61: Volcasaurus" activates its effect, if "Skill Drain" is activated, can it attack the opponent directly? 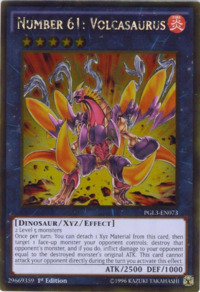 Also, if "Skill Drain" is active and "Number 61: Volcasaurus" activates its effect, can it attack the opponent directly? For monsters with 0 or ? original ATK, the monster is destroyed and the opponent takes no damage. For Token Monsters, the damage that is inflicted is equal to the original ATK set by the card that Special Summon the token. However, for tokens like "Emissary of Darkness Token" or "Malus Token" whose original ATK is ?, no damage is inflicted to the opponent. For "Embodiment of Apophis", its original ATK is treated as 1600, so 1600 points of damage are inflicted to the opponent. 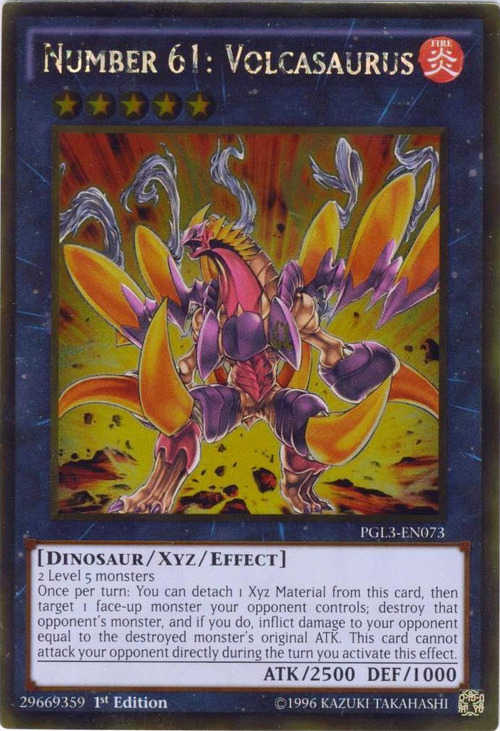 : As for the effect of "Number 61: Volcasaurus" that destroys a monster and inflicts damage equal to that monster's Original ATK, can the following monsters be targeted for this effect? -Monsters with 0 original ATK. -Monsters with ? original ATK. -Monsters like "Embodiment of Apophis".